This rock formation is called "Kannon-iwa Rock," because it resembles the bodhisattva Kannon. 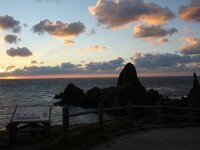 However, when seen from the hill at sunset, it looks like a lit candle, so it is also called "Rosoku-iwa" (Candle Rock). Even among the strange rock formations of the Kuniga Coast, this place stands out for its mystical atmosphere.